This is one of the most outstanding comedy musicals ever written. 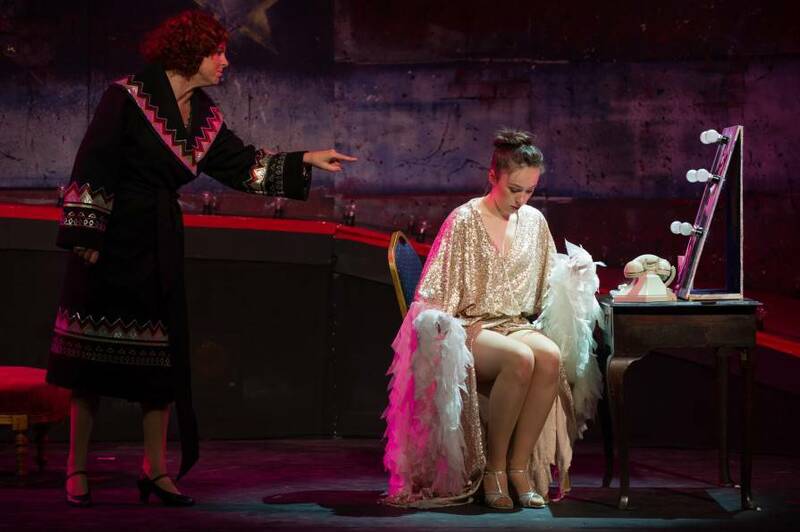 Based on the true memoires of Gypsy Rose Lee, it tells the story of the fiercely ambitious show business mother, Mama Rose and her daughters June and Louise. It is the late 1920s and the world of vaudeville is fast dying out. When June falls in love with a boy in the act, Rose turns her attention to the seemingly less talented Louise, but it is not in a tacky vaudeville that Louise is destined. Louise gets her break in the new sensation which is the spectacular and glamorous world of burlesque. With a score packed with hits like, ?Everything?s coming up roses?, ?Let me entertain you?, ?Together, wherever we go? and the show stopping, ?You?ve Got to get a gimmick?- Not to be missed! Can somebody tell me, what actors have to do to get a standing ovation these days? I really thought we were on the verge of witnessing one at Altrincham Garrick on Monday night, after the audience had been treated to a production of Gypsy that was flawless in every respect. But the audience, appreciative throughout nearly three hours of unadulterated musical pleasure, somehow managed to stay in their seats. The show is inspired by the memoirs of Gypsy Rose Lee who made her name as a burlesque entertainer and unusually for musicals of this genre you do care about the leading characters. Mama Rose may be the archetypal pushy parent as she strives to turn her daughters into showbiz stars but it's impossible not to like this larger than life, no nonsense character. Dawn Flint is fabulous in the role and she certainly does justice to the big numbers with her awesome vocal range. There's a great chemistry between her and her loyal daughter Louise, played to perfection by Megan-Hollie Robertson. 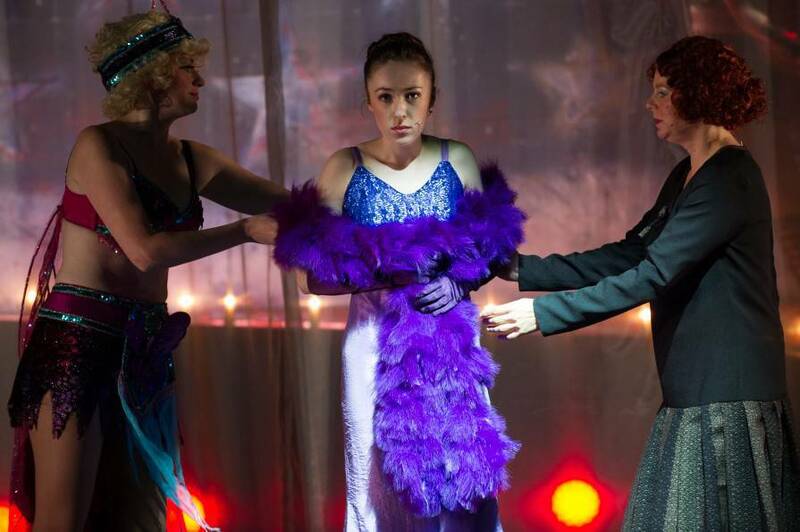 Megan-Hollie has a fabulous voice and is a very gifted actress, conveying her character's transformation from frightened rabbit to demanding diva quite brilliantly. Steven Finney is highly likeable as Rose's love interest, Herbie. ?The production's other big selling point is the choreography which makes for some truly exhilarating and memorable dance routines. 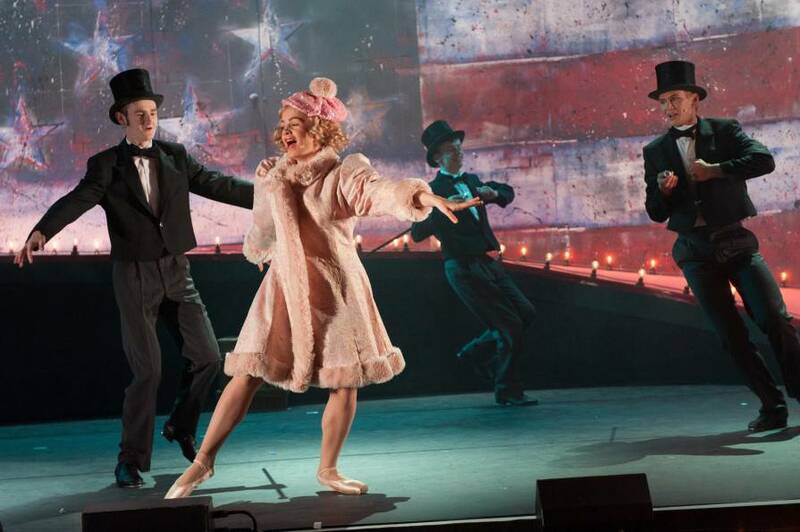 Choreographer David Needham, who is also the stage director, deserves an enormous amount of credit for this. 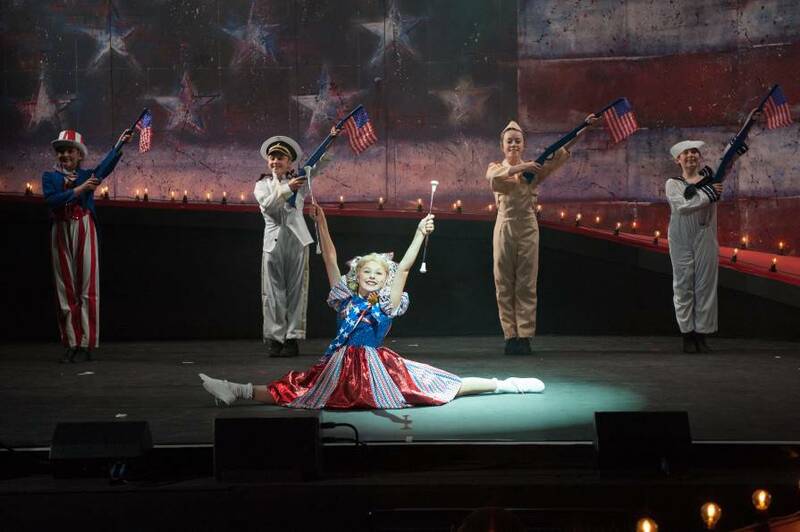 Sometimes children look as if they're performing in front of a firing squad when they're on stage. The youngsters in this production look like they've been acting, singing and dancing forever and I was particularly impressed with Isabelle Smith and Chloe Radford and Baby Louise and Baby June. If there were ever two children who were born to perform, it's these two. When word gets out as to just how good this Gypsy is, it is sure to sell out. So, make sure you don't miss the best musical to hit Trafford in years. Brilliant.
? "A Show to stop Hearts"
The Garrick?s production of Jule Styne and Stephen Sondheim?s Gypsy is a show and heart stopper to beat anything they?ve done before. The sheer professionalism of all concerned takes your breath away. As well as the cast, that goes for the seven piece orchestra, the 10 strong wardrobe department, the set designer, lighting and sound engineers and even the unnamed make up artist. This musical based on a book by Arthur Laurents is about real life star Gypsy Rose Lee. Rarely seen since 1959 it pinpoints a familiar theme ? the desire of parents to bask in their offspring?s? glory. This time the parent is Rose, a red-headed hunk of womanhood who cannot be ignored and leaves you in no doubt that show business is her business. She has two daughters. One, a lively, beautiful child, June, is a chip off the old block. The other, Louise is so quiet she is virtually ignored by her mother but eventually turns the tables on her in a spectacular way. The three times married Rose preens herself before men and one rather weak man, Herbie (Steven Finnie) falls for her charms. That?s the set up. And it?s an excuse for some lovely singing and dancing. The pivotal role is, of course, that of Rose. Dawn Flint is the perfect choice. She is pushy and brassy and has a fantastic voice. There are a couple of songs she sings with Steven Finney?s Herbie. They are Small World and You?ll Never Get Away from Me performed movingly by both. Her piece de resistance is Everything?s coming up Roses, as she stands in front of the apron which extends the stage, opens her arms and virtually envelops the audience into her bosom resulting in rapturous applause. The other two leading roles are played by Bethan Jacks and Megan-Hollie Robertson. 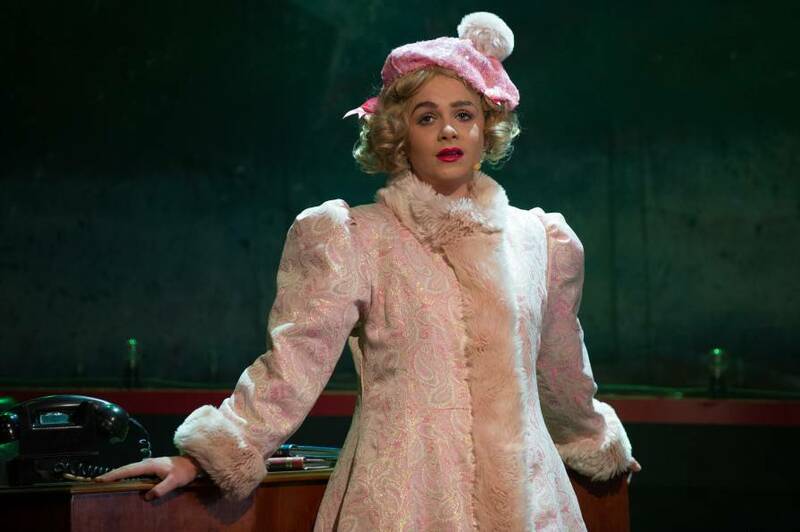 Bethan?s June is a regular little Shirley Temple as, wearing a blonde wig, she belts out Vaudeville songs as well as tap dancing and doing the splits. The role of Louise is even more taxing because Megan-Hollie has to transform her from a shy violet to an outgoing charismatic woman. The pair do well in their duet If Mamma was Married. There is an appealing scene when three strippers, played by Laura Chandler, Alexandra Howarth and Stephanie Niland sexily perform You Gotta get a Gimick. Sam Jones in the small role of Tulsa tap dances his way through All I need is a Girl in an unforgettable way. This is a great night?s entertainment and well worth seeing. There?s a Saturday matinee, too. I once heard it said that this show shouldn?t ever be mentioned as a possibility unless you know you have someone who was born to play ?her?, following on from that, I once read in an article talking about ?Gypsy? ; should the topic of the orchestra budget being reduced ever come up ? it?s time to close! If these two belting statements should tell you anything, it?s how vital these two components are to the success of this show!? Gypsy is not a project to be approached lightly, it?s a show which has everything and therefore needs everything throwing at it. Whenever I discover that I'm going to see a show I hold so dear to my heart, it?s not uncommon for me to sense a rush of nerves (and excitement). The excitement - well, that?s a given - but the nerves?? Could it be because I hold such high esteem and expectations towards the shows I adore most? This production was delivered with a modern outlook which is always an exciting prospect for me and something I always admire. Upon entering the auditorium it was clear, in an instant, that this production had been given a bold new stamp - however, I can?t deny that such a bold and new statement for this show made me feel a little nervous (that word again) ? and this is even before the houselights had begun to fade! Yes, I'm talking about the design of the show, and a masterpiece it was. The ?look?, created by Barry Purves was not what you?d expect for this show, it had a modern / contemporary feel and a fresh outlook; A distressed flag of the USA swooped across the stage suggesting that this piece is set against a time when America was suffering, a broken proscenium arch framed half of the stage to suggest that this was also a time when theatres and live entertainment were also wounded. The design of the staging was minimal with no real set changes, just the required furniture which worked and erased any unnecessary fuss and allowed the show to keep moving like the freight train it is! 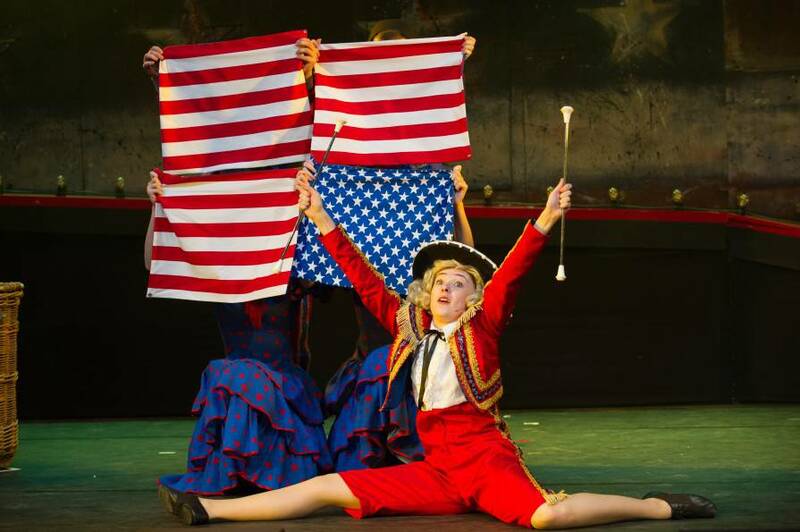 Dawn Flint (returning to the Garrick after a few years off) tackled what is arguably the most demanding female role in Musical Theatre?ever; Mama Rose! Dawn indeed demonstrated qualities required for Rose and interpreted this iconic Broadway figure with a good punch. Dawns highlights were in all the right places; ?Everything?s Coming Up Roses? & ?Roses Turn? were indeed her strongest moments. It would be unfair for me to grill this performance too deeply - I could go on forever - but what cannot be denied is the stamina to hold her own. With this epic and mammoth delight of a part, just to carry out what the book and score asks alone is a mighty achievement in itself on which she must be congratulated! The production was gorgeously directed (and choreographed) with tenderness and empathy by David Needham - the humour, drama and poignancy of this show were all impeccably exposed. Referring back to a statement I made at the start of this report, I was surprised to learn upon perusing the programme before taking my seat that instead of an orchestra, we were being given a seven piece band ? this, for me, was the shows biggest mistake. The Septet were indeed a strong and tight collection of musicians, though, no matter how well they each play an instrument, they cannot be expected to make up for so many missing parts. The marvellous Gypsy Overture (in fact; the very best of all Broadway Overtures) sounded empty and incomplete, as did all of the instrumentals throughout the show - though, giving them their due ? they did manage to fill out the sound for more of the show than I?d have thought possible considering they were approximately twenty musicians too few. This, the first musical presented by the Garrick under the new creative supervision of Paul Kerryson has attracted an influx of new blood to the company, this draw has enabled the Garrick to vividly broaden the scope of production genres they can now present, opening up an entire new and exciting catalogue of possible future productions, exciting times indeed! Before I get carried away ?back to the production in hand! - As important as new blood is to any aspiring theatre group, the part which stole this production of ?Gypsy? and ultimately brought the house down was ?Gotta Get A Gimmick? which featured two Garrick stalwarts (Laura Chandler & Stephanie Niland) and one new face to the Garrick, albeit a regular face amongst the local scene (Alexandra Howarth) ? these three girls nailed this sequence, undoubtedly the productions top highlight for me! Megan-Hollie Robertson took the role of Louise, at the tender age of just 19, Megan delivered the journey and telling of this character with such maturity and understanding, way beyond her years ? a beautiful actress with a voice to match.? The relatively short lived role of Dainty June was delivered on fine form by Bethan Jacks as was the two tots playing Baby June and Baby Louise (Isabelle Smith & Chloe Radford). Bill Platt and Mike Shaw presented many humorous faces throughout the production injecting good energy and fun into the proceedings popping up as Uncle Jocko, Pop & Mr. Goldstone et al.? Though, Stephanie Niland as Tessie (and making a delightful cameo appearance in Act I as Miss Cratchitt) stood out, her calibre? as an actress is second to none with a command and charisma so infectious, a superb performer! This production was indeed mighty, the overall delivery of this classic was presented to a very high standard which was indeed impressive and worthy of high praise indeed, many congratulations. 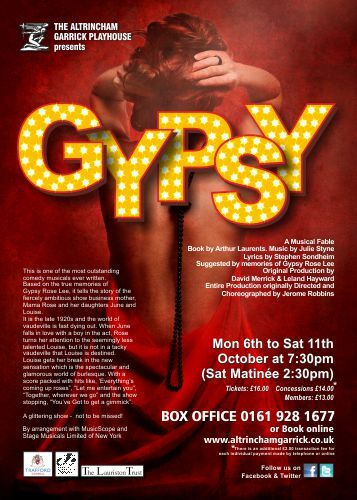 With a famous score that includes lyrics by one of the giants of the modern musical Stephen Sondheim, Gypsy is sure to cast a spell over Trafford audiences. The musical, Altrincham Garrick's next production, tells the story of burlesque entertainer Gypsy Rose Lee and has a score boasting showstoppers like Everything's Coming Up Roses and You've Got To Get A Gimmick. The show was inspired by the memoir of Gypsy Rose Lee - entertainer, actress, author and playwright.